I have always loved my mom. But it wasn't until I became one myself that I truly began to understand her. I say began because it is a journey of knowing her. Piece by piece, bit by bit, I see more of my mom in me. And that makes me proud. People say that she could be my sister. What do you think? 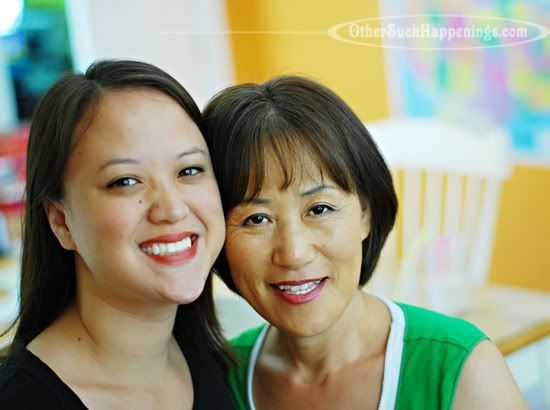 Visit i heart faces to see more Celebrating Mom photos! As in she looks like the sister you already have or she looks like she could be your sister? Your mom reminds me of my mom. I love your moms haircut. So cute! You guys look like great friends! Definitely a relationship to cherish! beautiful picture of both of you, and it's one I would cherish! Great job! I think you're both beautiful. Great picture! This is such a great picture of you two! You are both so beautiful! So glad I'm related to y'all. I love you!!!!!! that's a beautiful picture. i love the colors in the background and you two look lovely! Ridiculous beautiful. I want a copy! :) I love you! What a beautiful picture of 2 lovely and radiant ladies! Your girls are SO beautiful. Wow. What a great image. I love this! Amazing Marsha! Amazing. Amazing. Amazing!